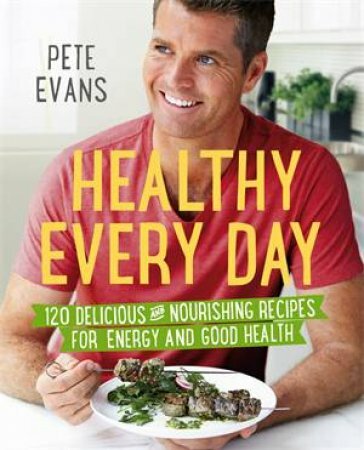 Australia's favourite celebrity chef and host of My Kitchen Rules, Pete Evans, loves nothing more than to nourish his body with fresh, healthy food. Food that not only tastes delicious, but also leaves you feeling great by providing all of the most important nutrients and avoiding empty carbs and bad fats. In Healthy Every Day, Pete shares all of his favourite recipes for good health and vitality. Inspired by a 'paleo' way of eating, these are the meals he cooks for his family every day, and they feature loads of fresh veggies, nuts and seeds, sustainable seafood and meat. There are no recipes for potato chips in here, but you will find one for crispy Kale Chips that will satisfy you and give you a hit of iron, calcium and antioxidants at the same time. And instead of the usual fatty and non-nutritious burger and fries, there's a Burger with the Lot that is full of flavour but won't leave you feeling bloated and sluggish. These recipes also draw on Pete's love of international cuisine, with inspiration from Thailand, Fiji, Turkey, Vietnam and Morocco. He shows you how to make lighter, healthier, but just as tasty versions of your favourite curries, salads and skewers. Pete has also been inspired by the fermented food of Korea and Japan, and there is chapter that shows you how to create your own Kimchi and other delicious fermented dishes, like Summer Kraut with Pineapple and Mint. And while you won't find any sugar in this book, there are still some delicious gluten- and dairy-free treats, such as Young Coconut Ice Cream and Raspberry Mousse Cheesecake. With Healthy Every Day, Pete makes it easy to change the way you cook and eat. This book will inspire you to cook and eat real food that will make you feel (and look!) fantastic.